Our Practice (the "Practice") is pleased to offer you access to certain of your medical information via this web-based or application-based system called MyChart® (the "Service"), a version of our electronic medical record. By clicking "I accept" or otherwise accessing the Service, your use of the Service constitutes your agreement to be bound by, and to act in accordance with, these terms and Conditions of Use (these "Terms"). If you do not agree to these Terms, you may not use the Service. The Practice may change or revise these Terms from time to time. Your continued use of the Service constitutes your agreement to comply with and agree to the then-current Terms. The Practice reserves the right to revoke your access to the Service at any time for any reason. In an emergency, call 911. You are required to contact the Practice or another health care professional by means other than the Service for any urgent or emergent situations. This includes reporting vitals or results that are out of the normal range that are input into the System through an integrated device or are manually entered by you. The Service should never be used in situations requiring immediate attention. In an emergency, do not submit messages electronically: Dial 911 or contact your physician instead. By using the Service, you acknowledge that you are requesting access to a portion of your personal health information and the ability to communicate with the Practice and its healthcare providers regarding your personal health information via the Internet using the Service. You understand that only a portion of your health information may be available through the Service and that the health information you access is released at the discretion of the Practice and you provider. The Practice will endeavor to provide timely responses to electronic inquiries. In some cases, Practice staff who respond to electronic inquiries may not be immediately available, so you should allow at least three (3) business days for a response. As in the office setting, the Practice's ability to respond to your electronic communications is based on the information you provide. If you provide insufficient information, we will be unable to provide accurate and reliable medical services. The Service may offer links to Web sited operated by third parties. The Practice does not control these Web sites and is not responsible for the content or performance of those sites. All health-related information and medical Web site links offered through the Service are intended for informational and educational use only. The Practice does not endorse or verify the accuracy of the information in/on these Web sites. You should not rely on any of the information found on the Web sites for purposes of treatment or diagnosis. Use of these sites is at your own risk, including but not limited to risks associated with harmful computer viruses. An individual must be age 18 or older to request a personal MyChart® account to access the Service. In making such a request, you represent and warrant that you are age 18 or older. 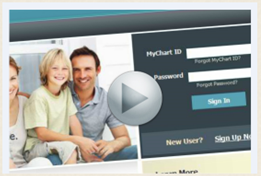 Parents or guardians may authorize a minor to have access to the minor's MyChart® account. Under State and Federal law, there are certain types of medical information that the parent or guardian of a minor patient age 12 or older may not view without consent of the minor patient. Due to these restrictions, parents and legal guardians of minor children ages 12 or older will obtain only access to limited information through the Service, unless full access is approved in accordance with the Practice's policies and procedures. Thus, when a minor child reaches age 12, restrictions will be placed on a parent's or legal guardian's access to the Service until the minor reaches age 18, at which time access by a parent or legal guardian will terminate completely. If the proxy's legal relationship with the account holder changes, the proxy agrees to contact the Practice immediately. The Practice reserves the right to revoke proxy access at any time for any reason. You must provide the Practice with an email and/or SMS text address in order to activate your MyChart® account. The Service will notify you via e-mail or SMS text when new medical information is available for viewing within your MyChart® account. This means that any person with access to your e-mail or SMS text will be able to see this notification. This could include your spouse, employer or anyone else that can access your e-mail or SMS text account. Although no private medical information will be sent, the notification that new medical information is available by accessing the Service may be information that you would not want others to know. Thus, you should take this into account when providing an e-mail or SMS text address. By enrolling in MyChart® and requesting email or SMS text communications, you agree that you have elected to receive electronic communications. While communications made through the Service are encrypted and generally secure, you understand that e-mail and SMS text messages outside the Service are not encrypted and are not confidential means of communication. Thus, if you choose to communicate with the Practice through any means outside the Service, you agree to waive any rights that you may have against the Practice, Franciscan Alliance (as the host of the Practice's MyChart® service), or the supplier or operator of MyChart, for any loss of information due to technical failures and/or unintended breach of confidentiality or unauthorized access to your information. Please know that if you send us an e-mail communication through the Service, it may be shared with the Practice staff that assists your provider in providing medical care, including any appropriate clinical staff. Messages you send via the Service will become a part of your medical record and will be accessible to current and future Practice providers and staff members who are involved in your care. The Practice affords the same degree of confidentiality to medical information stored within the Service as is given to medical information stored by the Practice in any other medium. The Practice is committed to protecting the confidentiality of your medical information. We limit the Practice employees' access and ability to enter or view information in the Service based upon their role in your care. Firewalls, passwords, encryption, and audit trails also are used to safeguard your information. The Practice will identify the records released and note the time and date of access each time a patient accesses the Service. We have taken steps to make all information received through the Service as secure against unauthorized access and use. For purposes other than general information viewing, the Service must be accessed with a Secure Sockets Layer (SSL) compatible browser, computer, or mobile device (the most recent browsers: Chrome, Internet Explorer, Edge, FireFox, Safari, Opera). Our SSL web server uses authentication and offers state-of-the-art encryption technology (2048-bit RSA). You can tell when you are secure by looking at the location (URL) field. If the URL begins with "https://" (instead of "http://"), the document comes from a secure server. This means your data cannot be easily read or deciphered by unauthorized individuals. You can tell whether you are truly connected the Practice by viewing the digital certificate. This certificate infrastructure ensures the user names and passwords are sent in an encrypted format. When you initially enroll to use the Service, you will be provided an activation code. With that code, you will be able to create a MyChart® ID and password. This ID and password will allow you, or anyone else who has the ID and password, to access the Service, view your medical information, submit comments that may become part of your record, and communicate with your health care team as if that person were you. For this reason, you should keep your activation code completely confidential. If someone creates a MyChart account using your activation code, you will be responsible for that person's access to the Service. You will be required to create a unique user name and password to access the Service and your MyChart® account. User names and password provide two layers of authentication and are stored in an encrypted database that is isolated from the Internet. As a user of the Service, your role in maintaining the security of your medical information includes: (1) Changing your password on a regular basis, and (2) Keeping your login ID and password confidential. The Practice shall not be liable for damages that result from a breach of medical record confidentiality resulting from your failure to keep your password secure. You may have the option to enable Paperless Bill Delivery Services. By enabling the Paperless Bill Delivery Service, you authorize the Practice to provide and deliver billing documents electronically through the Service notification system. By enrolling for Paperless Bill Delivery, you agree that you (1) have selected to receive an electronic communication – including a notification by email or SMS text that information is available for you in MyChart, and (2) acknowledge that no paper document will be sent to you. No Paperless Bill Delivery communication will be established until you select this option, or opt in through the MyChart® system. By selecting a Paperless Bill Delivery method, you agree that you are responsible for the payment of all applicable charges. The Service includes an on-line bill payment service. This service is made available as a convenience to you. If you prefer not to use this service, or if you do not accept the terms below, traditional bill payment remains available to you. By accessing the Online Credit Card Payment Service, you authorize the Practice: (1) to establish and maintain your payment authorizations; and (2) to process your payments according to your instructions. The Practice processes credit card payments for payment of services from within the Service. You can pay in full for services or you can sign up for a payment plan. Please see the Practice for payment options available to you. The Practice will use reasonable efforts to process all your payment authorizations promptly and properly, provided the authorizations actually are received by the Practice. The Practice will not be responsible for any failure to process a payment authorization that is not actually and completely received by the Practice for any reason, including user error, equipment malfunction, natural disasters or impediments, or inaccurate or incomplete information. You can direct questions regarding the Service to the Practice by contacting the Practice directly. The Practice licenses its MyChart system from a division of Franciscan Alliance, Inc. known as Franciscan Health Alliance Information Systems ("FAIS") through a program called Franciscan HealthConnect ("HealthConnect"). FAIS may require access to your MyChart account as necessary to address technical issues relating to the Service. FAIS will not use or disclose individually identifiable information except as necessary to review and resolve such technical issues. Your use of the Service is at your own risk. The Service may not be available at all times due to system failures, back-up procedures, maintenance, or other causes. Access is provided on an "as-is" and "as-available" basis. There is no guarantee that you will be able to access the Service at any particular time. During times when the Service is unavailable, you are encouraged to use other traditional communication methods (e.g., telephone) to retrieve or convey necessary medical information. NEITHER THE PRACTICE NOR FRANCISCAN ALLIANCE, AS THE HOST OF THE PRACTICE'S MYCHART® SERVICE, TAKES ANY RESPONSIBILITY FOR AND DISCLAIMS ANY AND ALL LIABILITY ARISING FROM ANY INACCURACIES OR DEFECTS IN SOFTWARE, COMMUNICATION LINES, VIRTUAL PRIVATE NETWORK, THE INTERNET OR YOUR INTERNET SERVICE PROVIDER (ISP), ACCESS SYSTEM, COMPUTER HARDWARE OR SOFTWARE, OR ANY OTHER SERVICE OR DEVICE USED TO ACCESS THE SERVICE. TO THE FULLEST EXTENT PERMITTED BY LAW, EACH OF THE PRACTICE AND FRANCISCAN ALLIANCE, AS THE HOST OF THE PRACTICE'S MYCHART® SERVICES, EXPRESSLY DISCLAIMS ALL WARRANTIES, EXPRESS, IMPLIED, STATUTORY OR OTHERWISE, INCLUDING BUT NOT LIMITED TO, ANY WARRANTY OF MERCHANTABILITY, TITLE, ACCURACY OF CONTENT, NON-INFRINGEMENT OR FITNESS FOR A PARTICULAR PURPOSE. WITHOUT LIMITING THE FOREGOING, NEITHER THE PRACTICE NOR FRANCISCAN ALLIANCE WARRANTS THE ACCURACY, RELIABILITY OR COMPLETENESS OF THE SERVICE, NOR DO EITHER OF THEM WARRANT THAT THE SERVICE WILL BE UNINTERRUPTED, ERROR-FREE, AVAILABLE, CURRENT, COMPLETE, ACCURATE, VIRUS-FREE OR SECURE. BOTH THE PRACTICE'S AND FRANCISCAN ALLIANCE'S, AS THE HOST OF THE SERVICES, ENTIRE LIABILITY AND YOUR EXCLUSIVE REMEDY WITH RESPECT TO ANY DEFECT IN OR DISSATISFACTION WITH THE SERVICE IS TO CEASE TO USE THE SERVICE. TO THE FULLEST EXTENT PERMITTED BY LAW, IN NO EVENT SHALL EITHER THE PRACTICE OR FRANCISCAN ALLIANCE, OR EITHER OF THEIR RESPECTIVE PARTNERS, SHAREHOLDERS, MEMBERS, DIRECTORS, OFFICERS, TRUSTEES, PHYSICIANS, EMPLOYEES, OR AGENTS BE LIABLE FOR ANY DIRECT, INDIRECT, CONSEQUENTIAL, PUNITIVE, OR EXEMPLARY DAMAGES OR LOSSES ARISING OUT OF OR RELATING TO: (A) THESE TERMS, INCLUDING ANY BREACH OF THESE TERMS; (B) YOUR USE OR INABILITY TO USE THE SERVICE (INCLUDING ANY CONTENT); (C) ANY CONTENT; OR (D) ANY INTERRUPTION, INTRUSION, BREACH OF SECURITY, COMPUTER VIRUS OR OTHER MALICIOUS CODE. THIS LIMITATION OF LIABILITY APPLIES WHETHER THE ALLEGED LIABILITY IS BASED ON CONTRACT, NEGLIGENCE, PROFESSIONAL NEGLIGENCE, TORT, STRICT LIABILITY OR ANY OTHER BASIS OR LEGAL THEORY. By clicking "I Agree" or otherwise using the Service, you represent and warrant to us that you possess the legal right and ability to enter into this Agreement and to use the Services and agree to be solely responsible for your use of the Service. By clicking "I Agree" or otherwise using the Service, you acknowledge that any previous consents given by you to the Practice will apply.